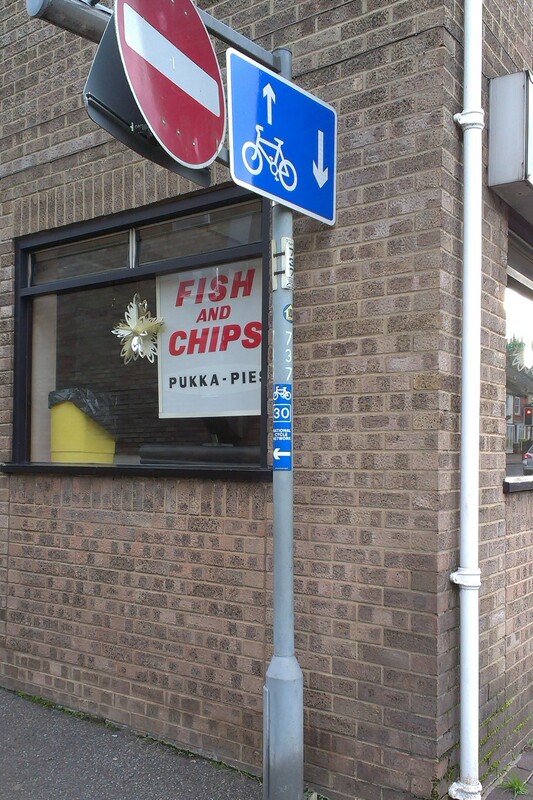 A cycling issue I’d been chasing with Norfolk County Council for several months has finally been addressed. 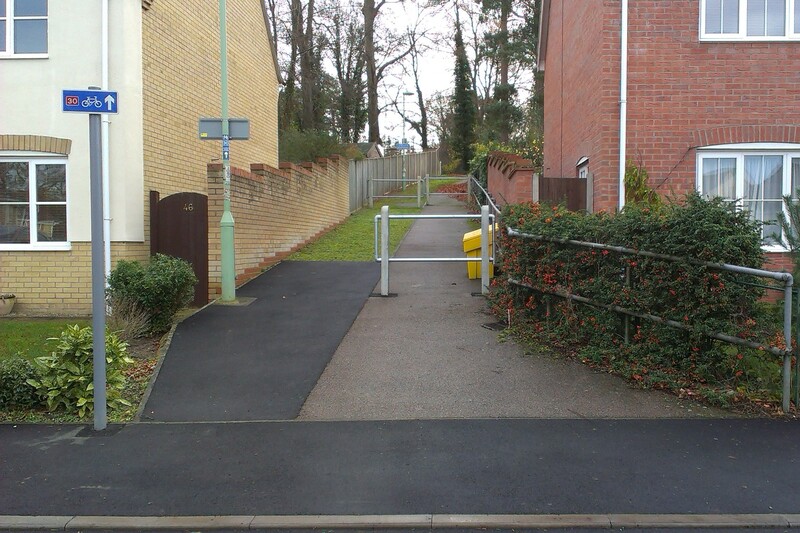 As part of the Thetford Academy building works, some adjustments were made to the north-west end of Joe Blunt’s Lane in Thetford. 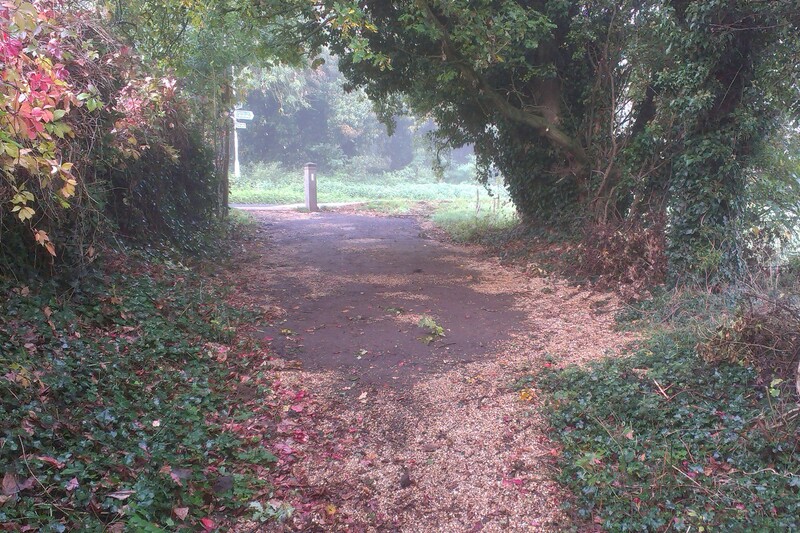 A new path was added alongside Croxton Road where Joe Blunt’s Lane meets the road, and a new path crossing the Lane from the main Academy site to the new car park was added a few meters further down. In both these places, a new shingle surface was added adjacent to new hard-surfaced areas. This is dangerous to any cyclists using the Lane, and as the gravel dispersed, step-changes in surface height would be left behind. 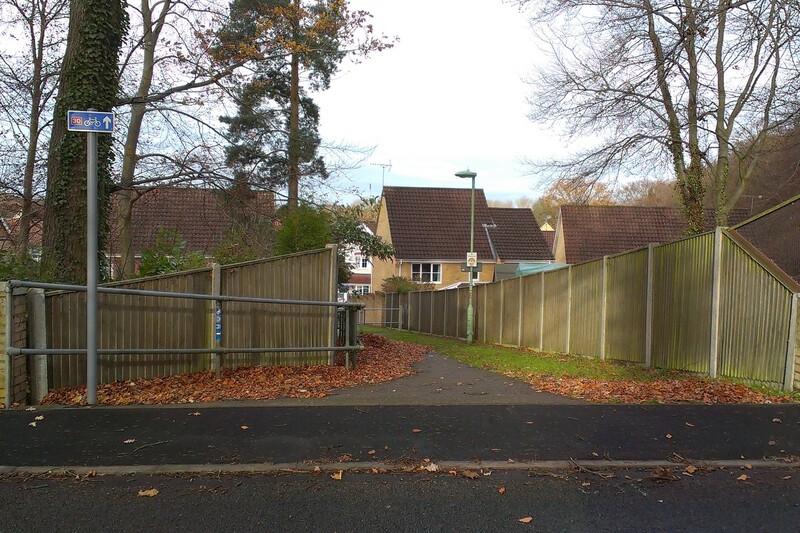 I complained to the council about this, who informed me that the single surface was contrary to the agreed plans. They asked the contractor to replace the shingle with a compacted sub-base material, which would be much safer for cyclists. It took several months and further chasing with the Council, but I’m pleased to say that when I visited the site today, the shingle had (mostly) been removed and the new sub-base material had been installed. The only slight snag is that a quantity of shingle remains just below the new surface at the Croxton road junction. This isn’t too bad, however, as it will naturally disperse over time. 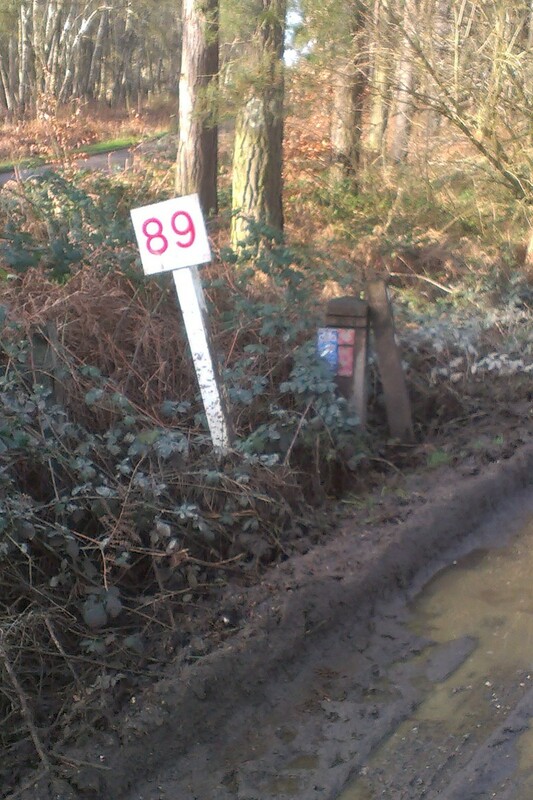 I went out for a route inspection ride today, covering Route 30 (and a bit of Route 13) between Thetford and Weeting. 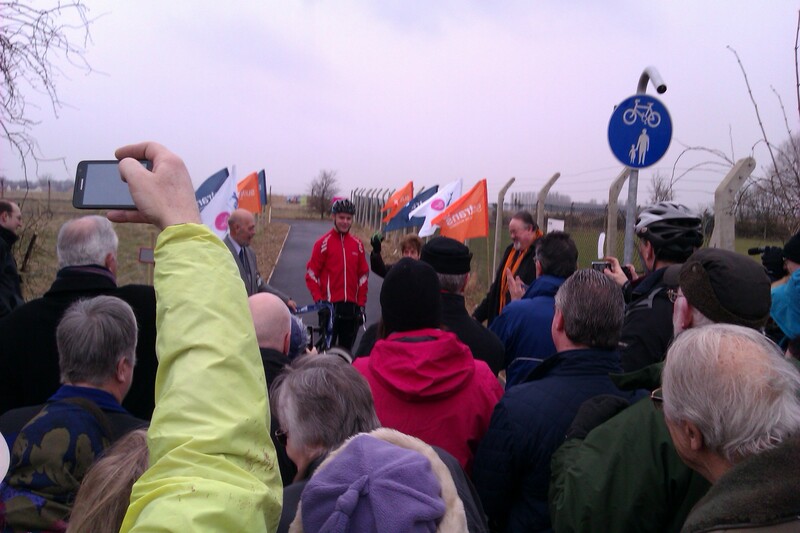 There were a few issues with signing to address, and some new council works on a cycle path to report. 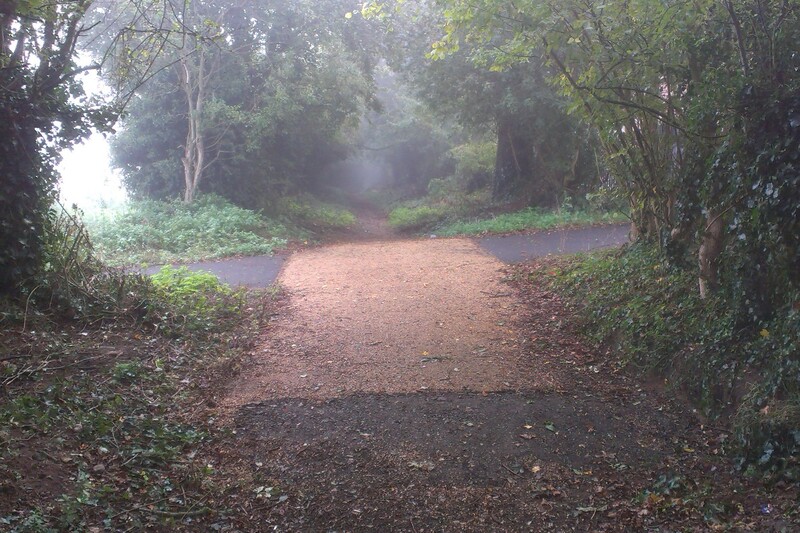 First of all, the council have provided some improvements to the cycle path between the C622 and Woodcock Rise at the eastern end of Brandon. Dropped curbs has been installed at both ends, and additional permanent signing has been provided. The signing leaves something to be desired though. At the southern end the sign at the entrance is end-on to oncoming cyclists. At the northern end a new pole has been provided to hold a sign, when there’s a suitable lamp post that would have done a couple of metres in. There are also two “Cyclists Dismount” signs with rather odd locations and orientations — travelling north there’s one a couple of metres from the end of the route, and travelling south there’s one about half-way along. 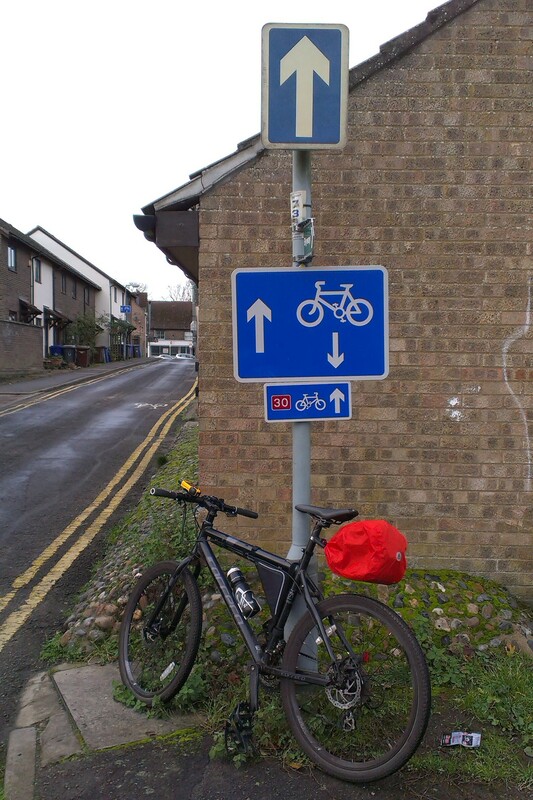 In Brandon, I fixed a contraflow cycling sign that had been turned around at the junction of Gashouse Drove and White Hart Lane, and replaced a missing sign at the other end of White Hart Lane. 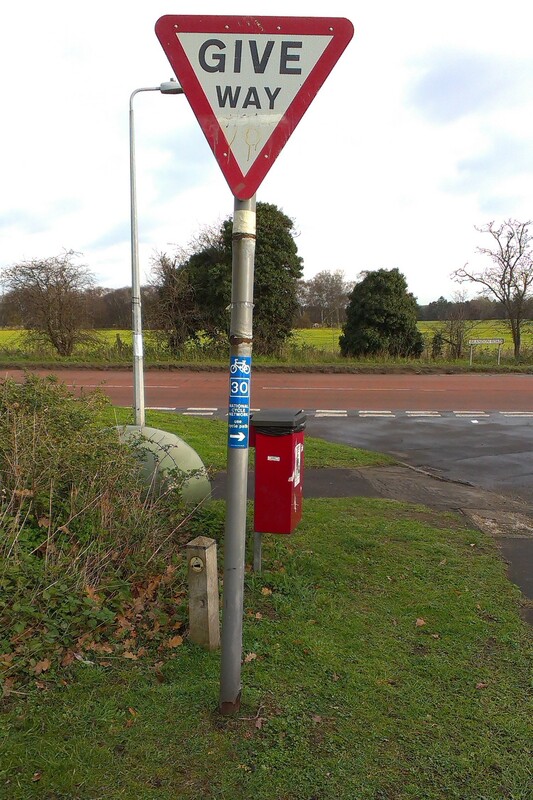 In Weeting, at the junction of the Peppers Close and Brandon Road, I replaced an old temporary sign and added a custom “Use Cycle Path” arrow, to help prevent cyclists from needlessly turning right on to the main road. 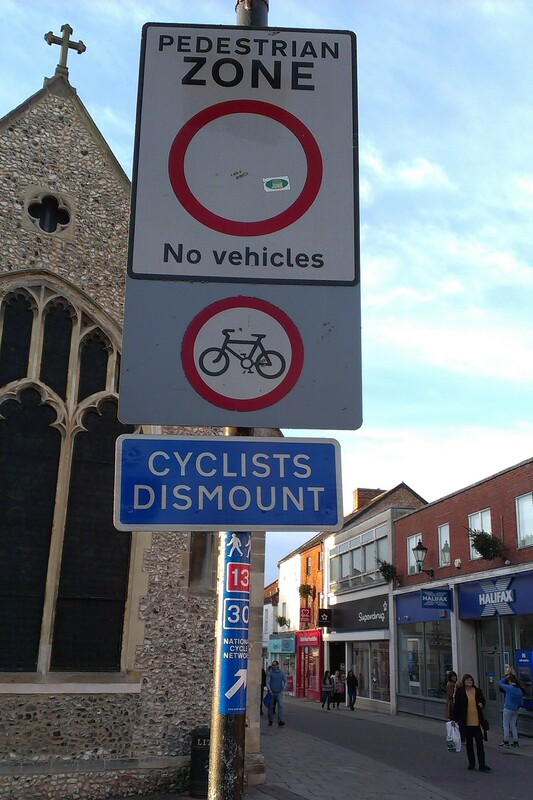 Finally back in Thetford, a “Cyclists Dismount” sign at the top of King Street needed re-orientating (again). Great news! Following council approval of Sustrans’ proposals, contra-flow cycling is now permitted along White Hart Lane in Brandon. 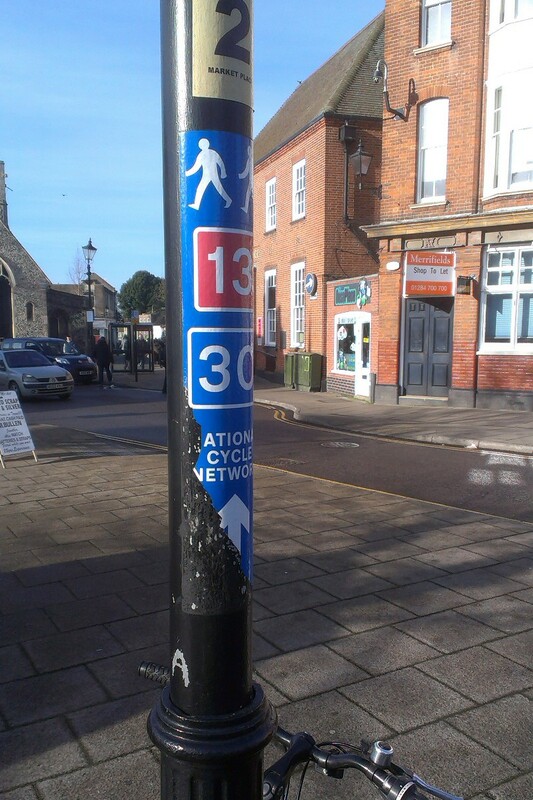 This was previously a one-way street, and cyclists following Route 30 towards Thetford had to dismount and walk along this road. 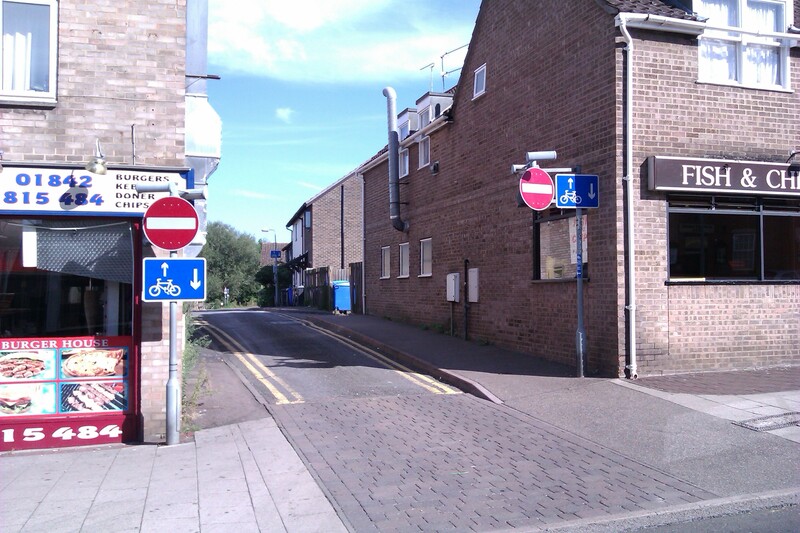 New signs erected recently allow cycling in both directions, while retaining the one-way status for other traffic. 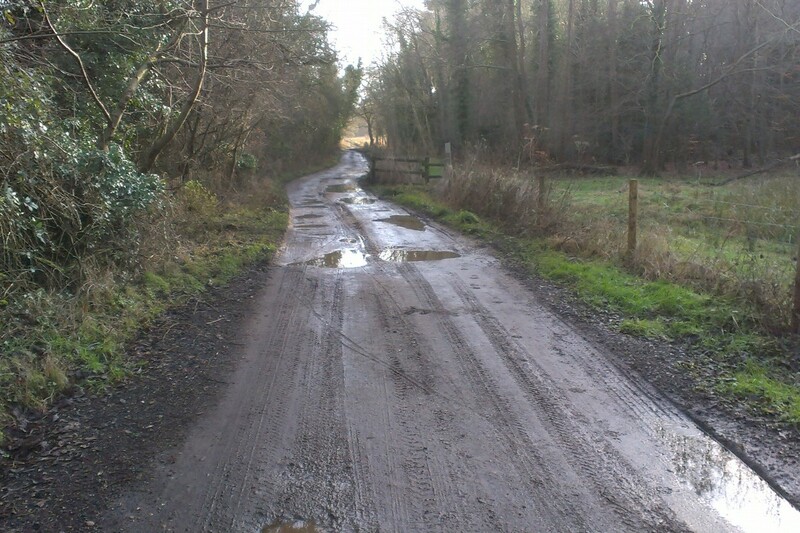 Following consultation at Sustrans, a diversion route has been agreed for Regional Route 30, to avoid a section of Harling Drove Road that is too sandy to cycle on. 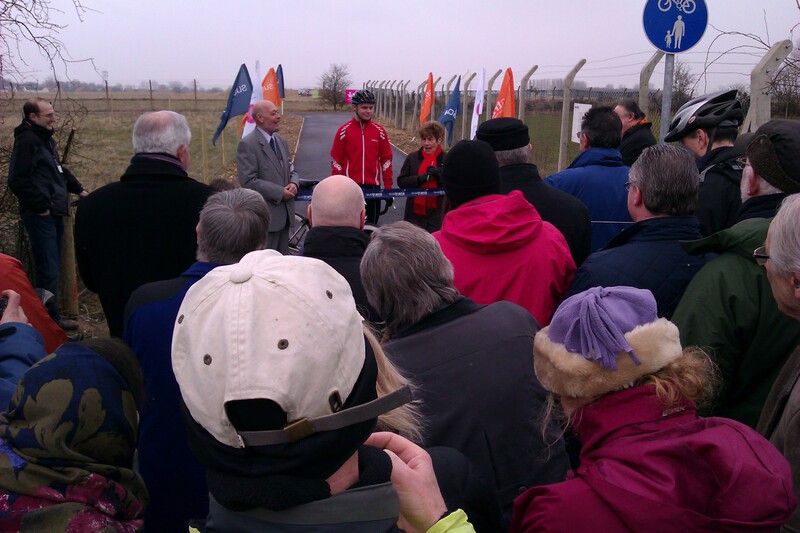 The new route will leave Harling Drove Road at the minor road north-east of Santon Downham. It then travels south-west, over the railway, through Santon Downham, and on to the edge of Brandon. 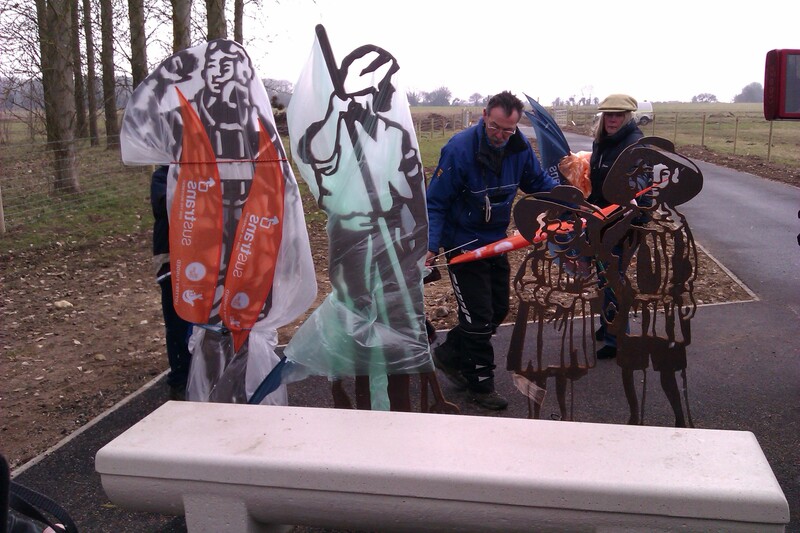 The route will then cut through the housing estate, and join Gashouse Drove to Brandon High Street. 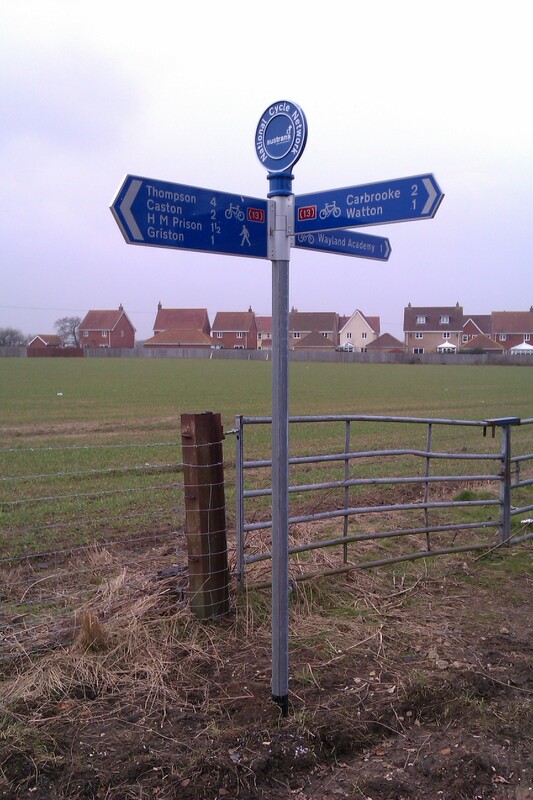 From there it will follow the High Street north, across the railway line and on to rejoin the old route at Weeting. The official Sustrans Map will be updated to reflect the new route in due course, and then I’ll make sure it’s signed fully signed.